Earn $76.49 in Rewards credit (7649 points) What's This? 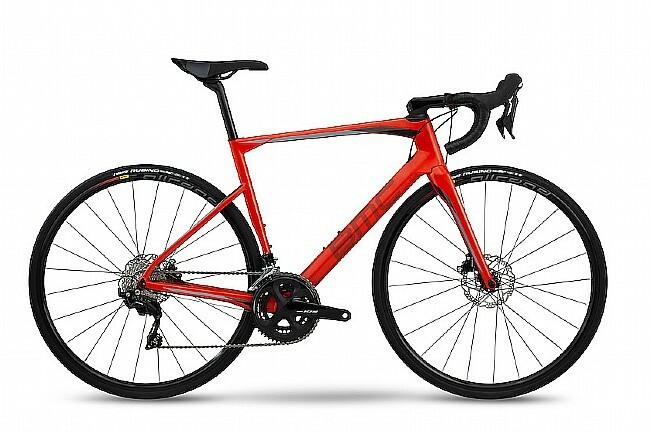 BMC's 2019 Roadmachine 02 THREE 105 Disc Road Bike is features light and sleek carbon fiber construction with integrated technologies and hints at speed from every angle. Frame: 02 Carbon, TC Endurance, Angle Compliance Technology, 12x142mm thru-axle. Fork: 02 Carbon, TCC Endurance Flat Mount, 12x100mm thru-axle. Brakeset: Shimano 105, SM-RT70 Rotors (160/160). Stem: BMC RSM01, w/ computer and camera mount. Seatpost: 01 "D" Premium Carbon, 15mm offset. Wheelset: Mavic Allroad Disc UST. Rims: Mavic Allroad Disc UST. Hubs: Mavic Allroad Disc UST, Thru Axle (12mm). Spokes: straight pull, flat; 2x front & Isopulse rear lacing. Axles: 12x100mm thru-axle (front), 12x142mm thru-axle (rear). Weight: 1100g (frame); 430g (fork uncut), 160g (seatpost uncut).